Powell's Upholstery is a family-run company, based in Calne Wiltshire, covering all aspects of Re-upholstery and soft furnishings. Established in 2000, Martyn and Sue Powell are the third generation of upholsterers with over 40 years of combined experience. We provide quality workmanship, with a personal touch, from start to finish. Powell's Upholstery is a company built on reputation with 100% satisfaction and many returning customers throughout our surrounding towns and villages. Sanderson (specialist), Morris & co, Romo, Jane Churchill,Voyage, Villa Nova, Casamance, Camengo, Jim Dickens, Warwick, Fibre Narurelle and many more. We also have a wide range of Leathers from budget to top quality bull hides, with Matt finish, full grains,pull ups and wax off, With a spectrum of colours to choose from. Please contact us with your enquiries, you can also email us a photo of your furniture for a Estimate. FOR UP TO DATE NEWS AND FABRICS, PLEASE CLICK THE FACEBOOK LINK, ON THE RIGHT. 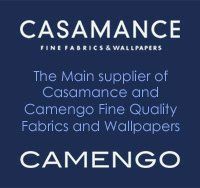 To view more fabrics and Wallpapers please visit CASAMANCE main website.